Laura Ashley, one of the world's best-loved fashion and home furnishings brands, started from humble beginnings. In 1953, after attending an exhibition on traditional handicrafts at the Victoria and Albert Museum in London, a young, unknown designer named Laura Ashley was inspired to make her own patchwork quilts. Unable to find suitable fabrics in the local shops of London, the enterprising artist decided to try producing her own. 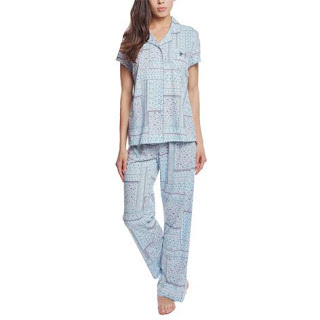 This lightweight button front long pant pajama set features a lovely blue patchwork print, with a notch collar and pocket detail. Our luxurious gift set of Sweet Pea and Freesia hand wash and hand lotion makes a fantastic gift for someone special. Presented in a branded Laura Ashley metal caddy, this softly fragranced set is ultra-moisturizing and smells divine to boot. Laura Ashley has just what moms want for Mother's Day! As a blogger, and homeschooling mom of four, one of the things I love the most is that I get to stay at home with my kiddos. The second thing I love is that sometimes we do pajama days. The kids and I get up, get our work done and just hang out in our pajamas all day long. Because I love pajama days, I love finding superbly comfortable pajamas. Laura Ashley's NOTCH COLLAR LONG PANT PJ SET is not only extremely comfortable but they're oh so soft. I also love how cute they are and that they fit just like pajamas should. Having already washed them a few times I can also tell you that they hold up pretty well as they still look brand new. If you're looking for something mom will love for Mother's Day, a good set of pajamas from Laura Ashley would be perfect! Another terrific gift from Laura Ashley would be their SWEET PEA AND FREESIA HAND WASH AND LOTION SET! What mom doesn't love lotion sets? I'm always running out of lotion and love receiving lotion sets as gifts. I also tend to wash my hands many many times during the day with four kiddos around so my hands are often dried out and thirsty for a good lotion. This lotion is extremely hydrating and I love the hand wash because it doesn't seem to dry out my hands. I also love how pretty this set smells. It's absolutely perfect for Mother's Day! Laura Ashley has a terrific selection of gift for Mother's Day that mom will love! Click HERE to find a store near you that sells Laura Ashley! Click HERE to learn more about Laura Ashley! Follow Laura Ashley on social media!